For years, people in the gardening industry — seed companies, plant growers, owners of garden centers — have complained that gardening is on the decline. People don't have time to garden anymore, they said. This younger generation just doesn't want to spend the weekend in the backyard. Or if they do, they don't consider the time they spend out there to be "gardening." They see it as "outdoor living." Outdoor living, according to the experts, seems to involve throw pillows and tiki torches, not manure and pruning shears. A friend of mine just returned from the California Pack Trials, a strangely named annual exhibition of new plants being rolled out by California's nursery industry. He actually heard horticultural consultants tell garden center owners that they should not refer to their customers as "gardeners" at all anymore. This new generation of customers would be insulted by such a term, as they consider a gardener to be someone who gets paid to work in a garden, and apparently, according to this consultant, that's not a good thing. In other words, a gardener is a member of the staff, and the lady of the house would be insulted to be mistaken for a member of the staff. She sees herself as a decorator, and it is the job of a garden center to sell her plant-shaped decorations. One exhibitor even posted a series of banners with a single-line caption on each banner. The first three showed a picture of a woman, and the last one had a picture of a man. The captions went like this: "She Looks. She Shops. She Buys. He Pays." This is all enough to make me want to dig a hole in the bottom of my compost pile and crawl into it. Just throw a little cottonseed meal on top of me and turn me over with a pitchfork in the fall. It is horrifying to imagine that anyone gets paid to dispense such boorish and condescending advice, and that anyone takes them seriously. All the more reason to buy locally grown plants at the farmers market and at independent garden centers. Anything to starve the corporate beast. But wait! Now everything's changed! The economy is in the tank, fuel and food prices are going up, and backyard vegetable gardens are back in. Seed sales have doubled at Burpee, and the Seed Savers Exchange has seen a run on seed potatoes, tomato and pepper starts, and vegetable seeds of all kinds. So much for tiki torches and throw pillows! Apparently the lady of the house is not just shopping and buying, she's getting her hands in the dirt, too. This must be terribly confusing for the consultants, but I'm sure they'll catch up. Meanwhile, a very cool new book takes a novel approach to growing your own food, and although it's based on an old idea (and is in fact a re-issue of a book that was published 25 years ago), it could not be more timely. 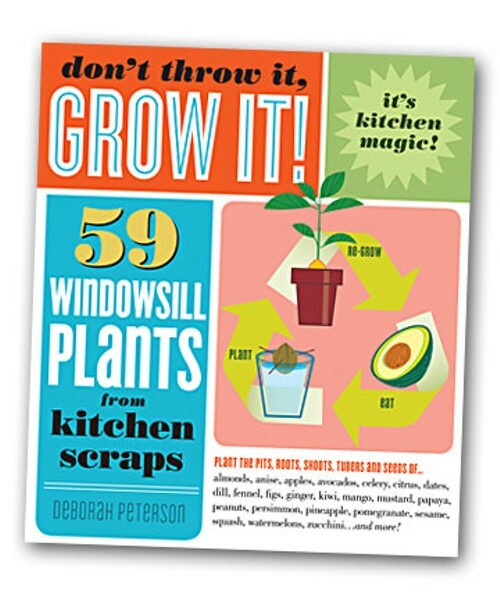 Don't Throw It, Grow It by Deborah Patterson and Millicent Selsam is a clever little collection of ideas for growing plants on the windowsill from kitchen scraps. If you've ever sprouted an avocado pit in a glass of water, you know what I'm talking about — but this book goes way beyond avocados. There's hardly a scrap of produce on your cutting board that can't be given a second life, according to the authors. Carrot tops, garbanzo beans, peanuts, jicama, lemongrass, ginger— they can all be made to grow again. Spices and nuts can be sprouted as seeds, fruits and vegetables will grow from cuttings, and beans and peas will turn into climbing vines in a jiffy. I try not to worry too much about the economy — I'm not stockpiling bags of rice just yet — but I gotta say, this thrifty and retro book offers up a nice little backup plan. If things get really bad, I can just eat my trash! Now all I need to know is how to start chocolate bars from the crumbs left in the foil wrappers, and how to sprout a fifth of gin from a bottle cap. If the consultants can figure that out, I'll start listening to them again.